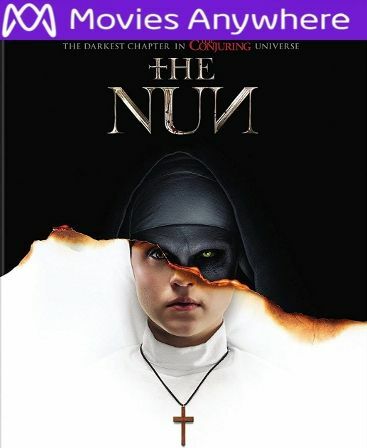 Digital UltraViolet and Digital Copy will makes it possible for you to stream the movie The Nun HD UV or iTunes Code instantly to your computer and compatible Smartphones, Andriod, iphone, iPod Touch, iPad and tablets devices anytime, anywhere. You can also download a Digital UltraViolet Copy or a Digital Copy of the movie The Nun HD UV or iTunes Code to your computer and compatible devices. When a young nun at a cloistered abbey in Romania takes her own life, a priest (Demian Bichir) with a haunted past and a novitiate on the threshold of her final vows (Taissa Farmiga) are sent by the Vatican to investigate. Together they uncover the order�s unholy secret. Risking not only their lives but their faith and their very souls, they confront a malevolent force in the form of the same demonic nun that first terrorized audiences in �The Conjuring 2,� as the abbey becomes a horrific battleground between the living and the damned.